When the earthquake hit Nepal in 2015, the newspapers were full of stories of the tragic event, the devastation left following the natural disaster, and the heroic clean-up effort on the ground. Less focus, as is often the case with crisis news, was given to the lives of the people who were affected by the quake, which is where the research project Aftershock Nepal came in. Aftershock Nepal took students from Bournemouth University and sent them to Kathmandu to report on the aftermath of the disaster and, more importantly, to challenge traditional crisis journalism by capturing the voices of Nepalese people who were dealing with life, loss, and repair after the earthquake. The project was run in partnership with Symbiosis International University and Amity University in India and Kathmandu University and Tribhuvan University in Nepal. Students from all five universities spent time working in a Kathmandu-based news bureau set up specifically for the project, gathering stories and publishing them on the Aftershock Nepal website, Facebook page, Instagram page and Twitter account. The students travelled through Nepal, gathering stories from far-flung places which are rarely accessible to journalists reporting during a moment of crisis. The team were encouraged to use a breadth of reporting techniques, utilising multimedia skills to present the stories in various forms, such as longer and shorter form writing, as well as video, audio and pictorially. Aftershock Nepal reporters also engaged with virtual reality, capturing some of the first 360-degree footage to come out of Nepal. “The kind of stories that they wanted to tell were those of ordinary people,” says Dr Sreedharan. This was about chronicling their life after the quake, what they went through, recording their day-to-day life experiences – while the rest of the world moved on, they were still rebuilding. It was humanitarianism journalism. 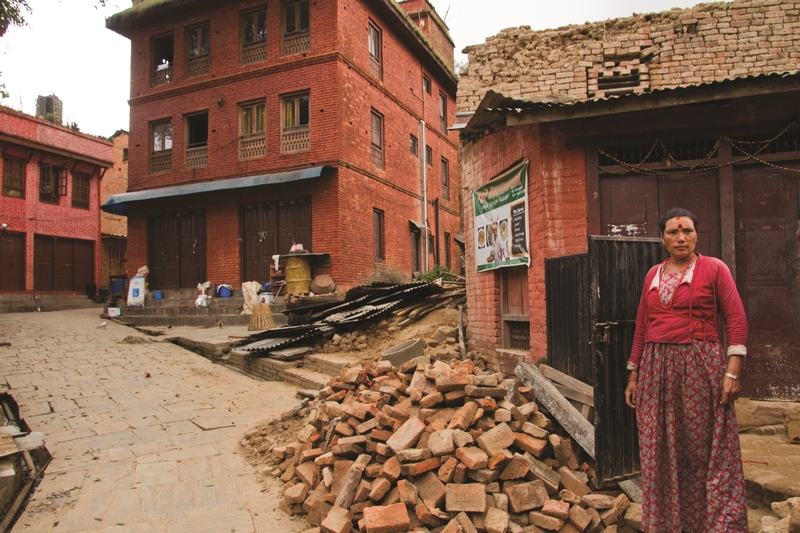 The inspiration for this project was informed by a longstanding body of BU research into crisis news and the resulting Aftershock Nepal project is an excellent example of professional practice and research blending together. The findings from this project were presented through conferences but, as Dr Sreedharan explains, this way of doing research is also unconventional. “It is slightly different to other studies. Our practice is our research and we want to understand the impact of what we did on stakeholders involved,” he said. “We did not publish a report and wait for the effects to filter through, we made a difference to individuals through the practice of research, and then through the conferences we kickstarted the process of writing about the project and analysing the impact our work had on the lives of those who were involved. This is the research that sits alongside the project. Dr Sreedharan and Dr Thorsen are now working to understand how this project has made a difference or produced changes in the process of crisis communication and reporting. Dr Sreedharan explains, “We are trying to understand what it means for journalism, and what it takes to cover a crisis over a longer length of time, the process of it and how to set it up. But we are also documenting what it meant to the students who took part in it, what did they get out of it, what did they learn, what challenges did they face? “We are also interested in the impact of this kind of journalism on readers, on other stakeholders, such as NGOs, external stakeholders and journalists. Our research is designed to develop a framework to understand their issues too, and the challenges they face in crisis reporting. We now have firsthand knowledge that we can use as research to make a real difference to this industry. The project will now have a further output, with a report on Aftershock Nepal looking at the process of the project, what happened, and the impact of the project. The project was the first to be funded by Global BU and followed a similar initiative, called Project India, where BU students covered the Indian elections in 2014.